One of my favorite things to do when taking a family vacation is to capture images that can help preserve our family memories. Often I take so many photos, that the majority sit on an external hard drive, waiting to be rediscovered again when life is a little bit less hectic and time is more abundant (if there ever is such a time). But I like to capture certain little details on our trips that can help spark a memory or a moment in time during our travels. And one day, I hope to create photo books for all of our travels, documenting the little and big moments of our trips. 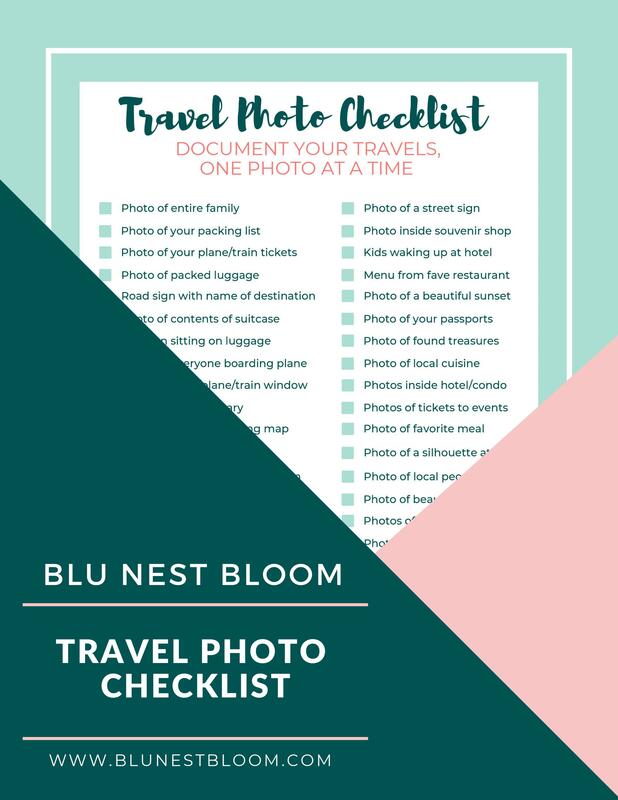 Because of this, I decided to create a Travel Photo Checklist to help myself and others remember to capture all of the little details that will help in preserving those sweet memories. This post may contain affiliate links in which I may receive a small commission. Please know that this is at no additional charge to you. I only recommend products that I use and love. You can read my full disclosure here. My goal, as my family’s primary photographer and memory keeper, is to take photos that tell our story. As you will see in my list below, I like to include photos of all kinds while documenting my family’s travels. So here you go – a list of 46 photos you should be taking during your many travels. Paper – I love this 32 lb paper for planner printables or any type of printables that require the use of a pen. This heavier weight paper will prevent bleed through which is of great importance when using any type of planner printables. Pen – These are the pens that I am currently using and I love them. They are also available in black. You can find those here. So there you go. You can hang this on your refrigerator or add it to your household binder and stay on track with documenting the little details on your next big adventure. Do you have certain photos that you find yourself taking time and time again while on your travels? How do you choose to document those special moments and memories while you are traveling with loved ones?